Our Maine Guide School prepares students to confidently enter the state’s testing and licensing process. 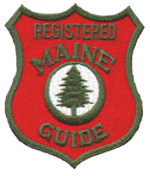 A Maine Guide’s License is not easily obtained, so it must be understood that “the patch” should not be taken lightly. As Master Maine Guides, we understand the business of guiding and believe it is unlikely anyone can be “taught” to be a guide. That is something that comes from the heart. Throughout history, Maine Guides have been revered as as some of the most knowledgeable and proficient woodsman in North America. This tradition began in the late 1890’s when the Maine legislature required all hunting guides to be registered with the state. It is a symbol with an honorable history. Wear it proudly! Our Guide School is the longest running program in the State, with 2017 marking our 25th year. Over the past two decades we have seen thousands of students, many who now run very successful Guide businesses. We typically see a 85%-90% success rate from our first-time applicants. In addition to preparing for the guide’s exam, students will also become better woodsman. They will gain knowledge on a variety of subjects from map reading, navigation, boating, hunting, species identification and countless other topics. Participants will also be given a wealth of information on starting and running a guiding business which we have gained through two decades of experience. Classes are four days in duration, Thursday through Sunday. Custom classes for small groups are available. References are always available. Contact us for more information on our Maine Guide School. 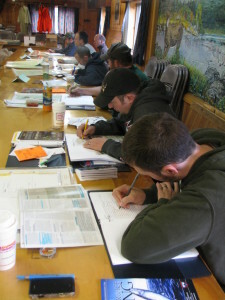 Using written materials from the state, as well as information developed over 25 years of instruction, students are ready for the Hunting, Fishing and/or Recreation guides license examination. This course builds top notch map and compass proficiency, and equips students to react quickly and efficiently during stressful situations, such as a lost client or medical emergency.